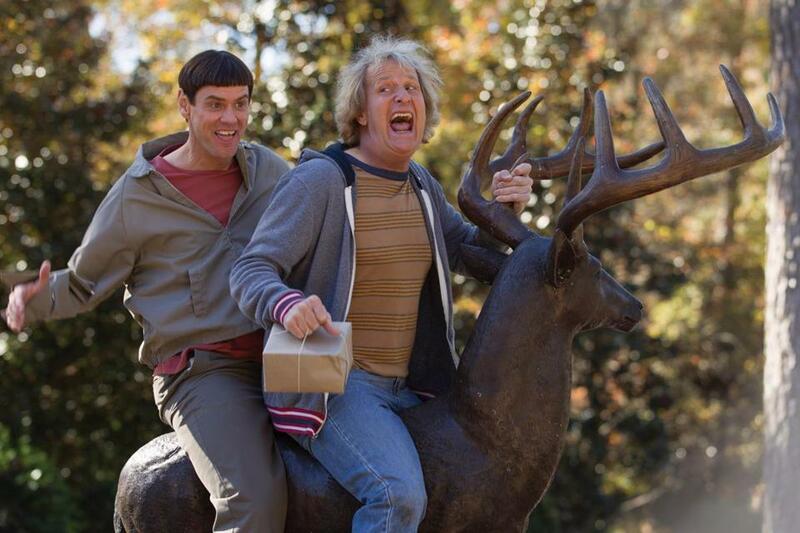 Is “Dumb and Dumber” really 20 years old? On the evidence of “Dumb and Dumber To,” Harry and Lloyd — and the giddy moron humor they embody, embrace, and expel — are eternal. There’s absolutely no need for this belated sequel, other than the fact that costar Jim Carrey and writer-directors Bobby and Peter Farrelly (a.k.a. Providence’s finest) could use the career lift. Jeff Daniels, as always, seems to be doing just fine being Jeff Daniels. But everyone has piled into this dumber, sillier, more consistently funny reprise with an enthusiasm that’s infectious, and not in a low-grade medical way. While “Dumb and Dumber To” picks up two decades after the original, nothing much has changed, literally in the case of Lloyd (Carrey), who has been in a catatonic state the entire time. He snaps out of it, gets his hair styled in the familiar bowl cut and rejoins Harry (Daniels) — who still sports his tragic blond blowout — on a road trip to find the latter’s long-lost daughter, whom a youthful one-night stand (Kathleen Turner) gave up for adoption. Harry needs a kidney, and it takes him a while to realize his own adoptive Asian parents (Michael Yama and Nancy Yee) aren’t a genetic match. There’s a plot of sorts, involving the grown daughter — played by Rachel Melvin as a charming ding-a-ling — attending a highbrow KEN conference while her evil stepmother (Laurie Holden) schemes with the strapping handyman (Rob Riggle) to murder her way into millions. Ho-hum. The moth-eaten pleasures of “Dumb and Dumber To” have far more to do with Carrey, Daniels, and the Farrellys competing to out-stupid each other in novel and cringingly amusing ways. If that suggests that Carrey carries the load of the comedy, that’s only because Daniels’s Harry is so sweetly, densely reactive. True, Carrey has more to prove at this point in his career, and his high-impact energy can be grating. But then the Farrellys will park their camera as the star eats a hot dog, with mustard, in one go without hands, simply for the disgust-o enjoyment of it. You almost feel like applauding — and then taking a shower.